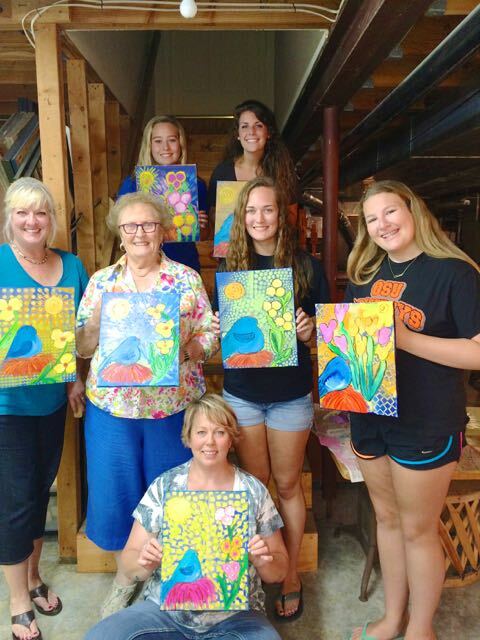 Paint-along sessions are a great way to explore your creativity while having fun with friends - old and new. Everyone's happy when they're playing with paint! 1) Open Sessions - these are open to anyone. Come alone or bring your friends and also meet new people. Plan on about 2 to 2.5 hours to complete a painting. 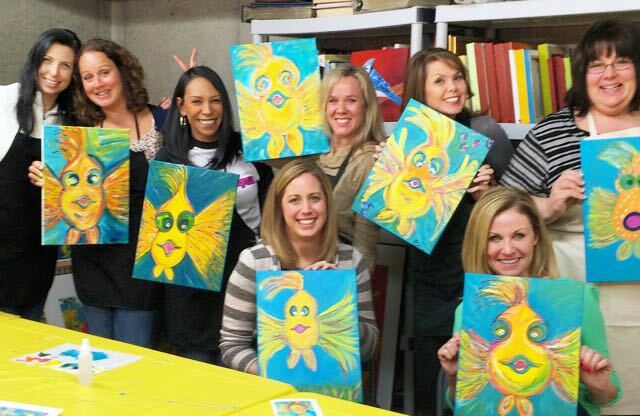 2) Private Paint Parties - these are parties that you organize and you invite your family and friends to paint. Plan on at least 3 to 3.5 hours which gives you time to "party" as well as paint. a group of friends "just for fun"
for private paint parties, you'll bring your drinks and food for the party, usually appetizers and desserts - but hey, it's your party! We've had birthday cakes and even soup. I invite you to read a blog to know what to expect if you go to a private paint party - this applies to open sessions, too. Click here for more information on these fun artistic events. Contact Claudia to sign up or to schedule a private painting party for you and your friends! Check out these happy painters! Contact Claudia if you're interested in a 4 week class to really learn to paint. "In Claudia's workshops I am inspired by the playful subject matter, being encouraged to loosen up, and have fun! !